As Dads go, my husband Alex is more hands-on than most. “I’m not an alpha male,” he says, and he’s right – his 6’6 stature and full beard are betrayed by his mild manner and gentle voice. Sitting together in the home we share in Brighton, Alex talks passionately about his recent experience of using Amaze, a local charity that was launched in 1997 to offer information, advice, and support to the families of children and young people with special educational needs and disabilities. Alex recently attended one of Amaze’s six-week ‘Insider’s Guide’ courses, which offers a mix of practical skills, such as dealing with meetings or helping your child have a social life, as well as a supportive space for parents to share their experiences of raising a child with additional needs. He was the only man in the room, something he tells me didn’t bother him in the slightest. “When I went along, first of all, I thought there might be more of a mix. It’s not relevant though; we all let our guards down and it was very emotional. I’m in a similar situation to all the Mums,” he says. 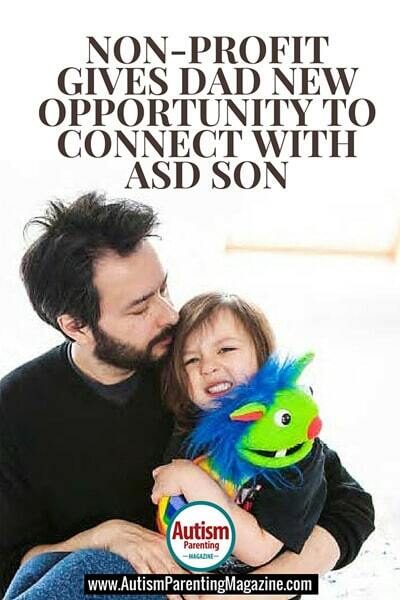 The situation that Alex is referring to is that our son Bobby, who recently turned four, is currently in the process of getting a diagnosis of Autism Spectrum Disorder, or ASD. “Once we found out that Bobby was autistic we were looking at various ways of getting advice and information, one of which turned out to be Amaze,” recalls Alex, who found out about the course through our children’s preschool. The fact that Amaze takes a radically different approach to the paper-pushing that Alex anticipated is what made the experience so enjoyable. He describes how getting to know the other members of the group made digesting all of the information much easier. “When you’re in a peer support group, that makes the stuff which is actually about the structure of schools easier to discuss. If they went into all of that in the first week, and you’re sat in a room full of strangers, it would be useful but you’d probably be thinking, ‘Oh I can get this information online,’ but because the first three weeks were really about analyzing you as an individual and your relationships and how you handle situations and people, it’s very personal,” he shares. It’s clear that Alex has been a valued member of the course. “They give out little gifts each week and they were apologetic, because the gifts were predominantly feminine and they went out and bought a couple of men’s things for me. They say they’re pleased that I’m there and joked that they weren’t sure I’d be back after the first week.” Perhaps before starting, he wondered the same thing himself, but for Alex, accessing support through Amaze has clearly been a positive experience. “I’ve realized that raising a child with additional needs is not something me and my family need to go through alone. I had no idea Amaze existed, but I imagine we’ll be using it a lot. It’s quite incredible. Stephanie Lake is a writer and stay at home Mum to her two boys, 4 and 2. Her son Bobby has high functioning autism and loves to learn about dinosaurs and prehistoric marine life. Stephanie is particularly interested in education, having worked as a primary school teacher for four years. She loves spending time with her family, as well as trail running and volunteering.